I-471 S to US 27 S. Take AA Hwy (Rt9) East. Country Lake Dr is just past Rt 1997 on right. Or take I-275 to AA Hwy (Rt9) East at Wilder. Continue to Right on Country Lake. 1st driveway on the right. Private rural living w/quick access to city. Minutes to US 27/Cold Spring. 15 minutes to I-471. 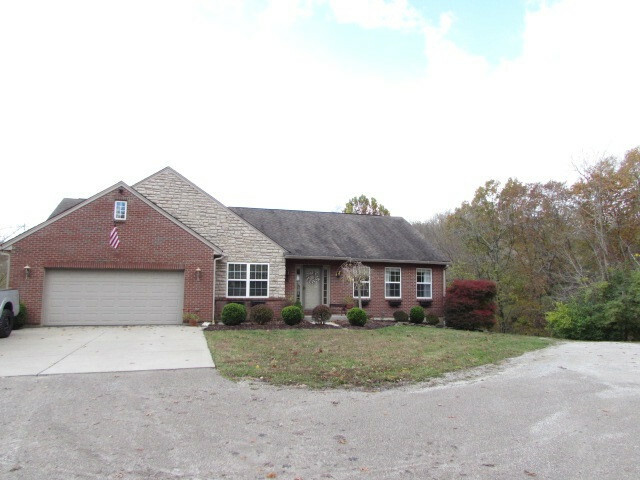 Brick ranch on 2.4 acres just off AA Hwy. Features 5 bdrms & 3 full baths. Cathedral ceilings thruout the main living area. Abundant kitchen cabinets w/beautiful GraniteCrete tops. Spacious mstr suite offers sitting/dressing area, master bath & walk-in closet. Finished LL boasts fam rm, bar & eating area, additional play or exercise area & full bath. Plus bdrms 4 & 5. Deck & patio overlook beautiful treed acres & creek. Large new storage bldg. Footers in place for 30 x 30 detached garage.